Fake News & Data Mining & Collusion, Oh my! 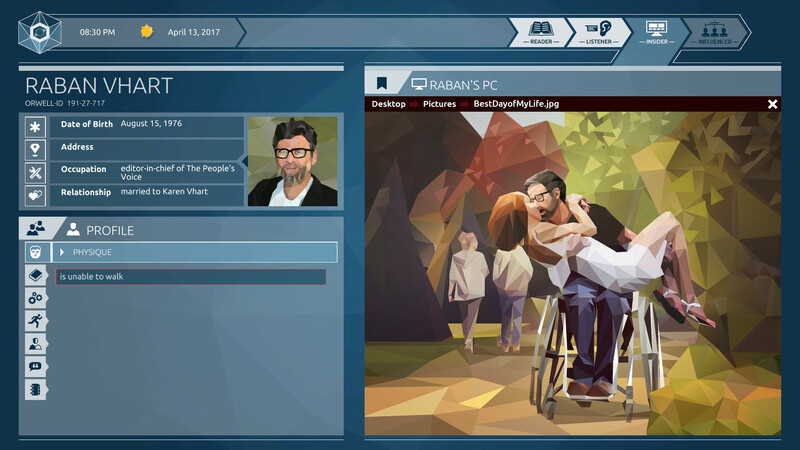 I fell in love with the first Orwell game when it was released back in 2016. AS someone with a little experience with intelligence analysis (a story for another time), I was struck by how accurately it captured the moral quandy of sacrificing the few for the good of the many and calling for action based on intelligence you just have to trust is true. Because there is the very real fear that you’ve made a horrible mistake or misjudgment, and that could lead to lots of people ending up dead. Orwell: Ignorance is Strength is a stark reminder that satire isn’t always funny; sometimes, it’s terrifying. The premise is similar to the first game: you play as a nameless intelligence analyst working for a country simply known as The Nation. Your job is to sift through the lives of people of interest to determine their threat level, pass the info along to The Director of the Orwell Project and watch as action is taken based on your work. The mechanics are almost identical to the first game as well. Players must comb through web pages, computer document, audio logs and phone records to find information relevant to your assigned person of interest. Data chunks are uploaded to the Orwell database, updating files and unlocking new branches to the investigation. There is one new mechanic introduced in Ignorance; the “Influencer” tab. While it isn’t utilized until late in the game, it allows players to plant out-of-context information and twisted truths to news sites and social media to sway public opinion and make it easier to discredit enemies. This makes game play a lot more interesting as players must craft their own version of the truth while hunting down actual leads. It is all the more fascinating, considering the main protagonist is the Orwell universe’s version of Alex Jones. 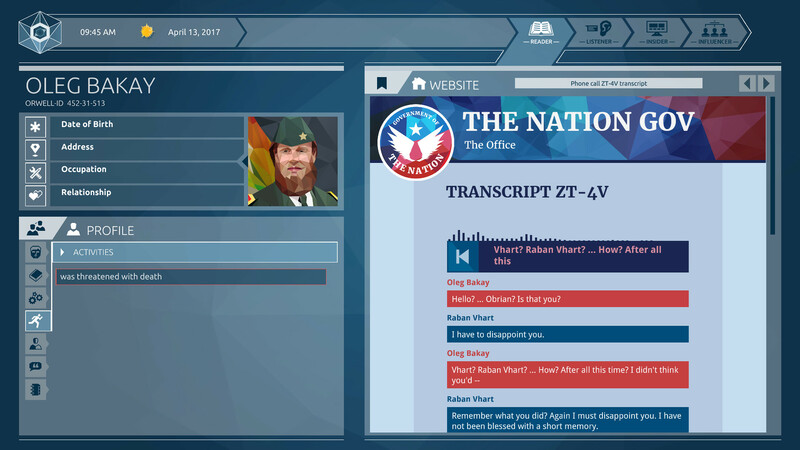 If you’ve played the first Orwell, and still have a finished game file available, you’re able to carry over save information. Unfortunately, I had uninstalled my copy, so I wasn’t able to see how this affects game play. But I can’t see it being a huge influence outside of flavor text and lore. Players new to Orwell will have to learn to multitask and make quick decisions. Information becomes available in real-time. Bugged phone calls can come in while combing through social media pages, and transcripts won’t always be available. So players will have to judge for themselves what information will be relevant to their investigation. Be warned though; any unexplored data will be permanently locked after players close out the day. Like Where the Water Tastes Like Wine, Orwell: Ignorance is Strength is not for players who don’t favor a lot of reading or world building over action. But if political ideologies and government policy interest you, or if you’re at all curious to see what actual intelligence analysis is like, it might just be the game for you.